The other day I was surfing Pinterest for some holiday decorating inspiration. I came across an adorable wreath, but when I clicked through, it went to an Etsy shop where the wreath was for sale for $60! With no tutorial to go on, I took the inspiration and made a plan to recreate the wreath. Below is the tutorial I came up with after making the wreath. The materials cost me about $20 in all, but would have been less if I had used a cheaper red fabric or had found a used wreath form at the thrift shop. I love how this turned out and it will look great on my door this Christmas. 2-3 Yards of red fabric. I used a red silk fabric, but you can use anything you like. Step 1: Cut the red fabric into 3" x 3" squares. Step 2: Fold a square in half and then in half again to form a small triangle like in the series of photos above. 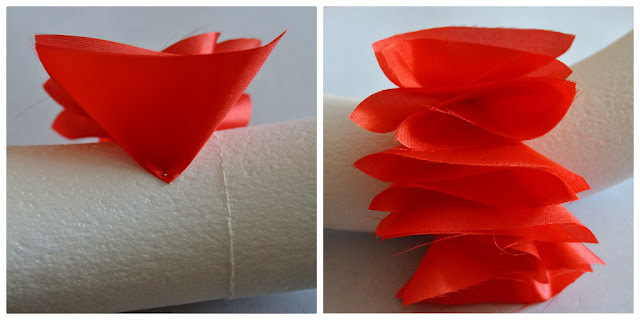 Step 3: Place a pin through the bottom corner of the fabric triangle and start pinning them down the wreath starting from the inside to the bottom outside rim. You only need to go as far as will be seen when the wreath is hanging on the door. The back of the wreath can stay empty. Step 4: Continue pinning the fabric triangles in lines around the wreath and filling in any gaps as you go along. Step 5: Cut out two strips of black felt for the belt on the wreath. Pin them into place in the center of the wreath. Step 6: Trace and cut out a belt buckle shape from the sparkly foam sheet. 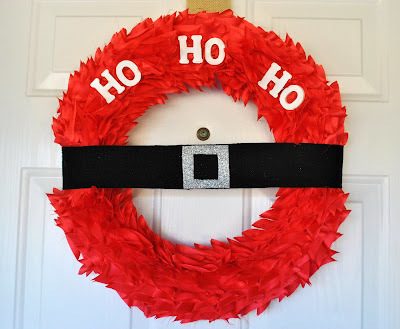 You can use a hot glue gun to attach it to the two strips of black felt already on the wreath. This will attach the entire belt together. Step 7: Hot glue three sets of letters on the top of the wreath to spell out "ho, ho, ho." 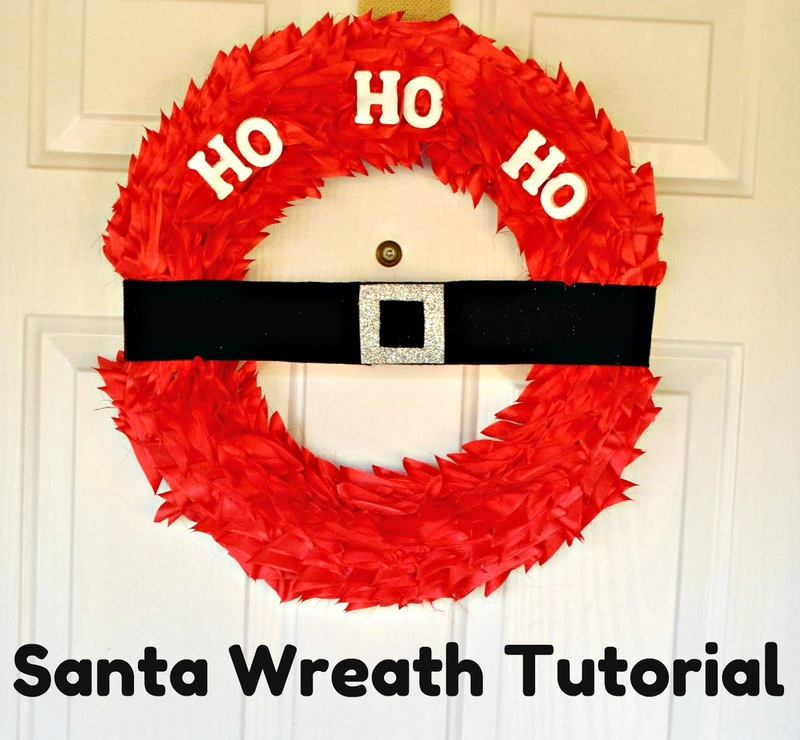 You can obviously change things up as much as you like, but this basic tutorial will help you create this cute Santa wreath. That is such a cute wreath and it looks so easy to make! Adorable idea and it seems like something even I could manage! I JUST pinned something like this yesterday but I think it was made with feathers. Wow, that's beautiful! I love it! WOW Kathleen your so creative. I love it. I truly feel inspired. Looks very easy! Thanks for the tutorial! Jennifer, unfortunately, you have to pin each on in rows to create the same effect as in the picture. If you wanted a more ruffled look and used a thicker fabric, you may be able to get away with pinning more than one at a time though. Also, if you by fabric squares pre-cut it is a huge time saver too. Very, very cute!! This would make great Christmas gifts for teachers. ah ok. What about using a dab of hot glue instead of a pin? Of course in that case you can't just take it apart each time you want to make another wreath. But I am just wondering if you think the hot glue would stick and hold to the wreath foam. This is so cute! Great tutorial. I love this! You are so super crafty!! Looks fun and easy. Definitely on top of me and my kid's DIY list for Christmas! Thanks for the great tutorial! That is just so cute. Thank you for the step by step instructions. You make it look so easy (and perfect). I know there are definitely those who have made similar wreaths and used hot glue instead of pins. It would be a lot of hot glue though and for a project like this with so many different pieces, I just liked using the pins more. It would work with hot glue though! How cute! I wonder if I could bribe my son to help me fold all the squares. This is seriously adorable!! I love it!! LOVE it! LOL Billie, my oldest helped fold some and then my sister did too. It's definitely a lot quicker when someone helps. You have become my go-to for craft ideas! They're always so beautiful/neat/cute and yet, not so difficult that someone non-crafty like me can do them! Thanks! my step mom makes these for the holidays, SO CUTE!! Adorable! This would stand out so great on my front door. Thanks for sharing! i LOVE this...i'm making one for my front door. very clever, i may even throw a santa hat on top....thanks so much. That would be a great addition Kath! What a adorable and cute wreath. Love it! Thanks for a great tutorial! What I like the most about it (besides how easy it looks, and the bright red color) is how different it is! Very nice! I love this! This has got to be the cutest wreath ever. You have such great crafts. Thanks for the post.